Scratching your head over the mysterious disappearance of those buddies who left for the Bighorn three months ago and never showed up to brag? Baffled by brand new tippets still in their Orvis wrappers you’ve found streamside just about everywhere you’ve fished this summer? Flummoxed by great gear seemingly falling from the skies, including that great 5 weight Winston you snagged last evening? Well, Pal, you’re one of the lucky fishermen to have survived “Hell Hatch,” the monster mayfly hatch that has reduced avid fly fishermen to a pitiful, trembling few double haulers! Now, the largely unreported story of pupae purgatory has been filmed in terrifying detail by Wayne McLoughlin in his new masterpiece of the same title! 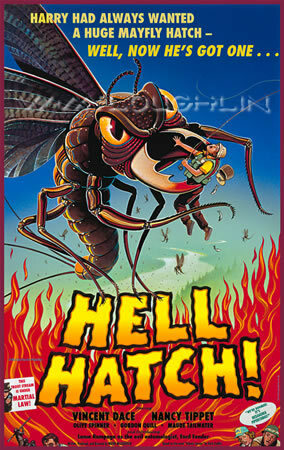 And “Hell Hatch: The Movie Poster” has been released just in time to commemorate the never-to-be-seen movie! Yes, you can purchase the poster with its real stars as shown, or you can memorialize those pals whose treasured gear is now yours forever! Choose a total of ten names for the "Starring," "Co-starring," and "Introducing" categories, order your print, and we'll fax or e-mail you a proof.